Director of the Antarctica Experience Briege Whitehead at the National Museum of Australia. Credit: Elesa Kurtz. For seasoned glaciologist Tas van Ommen, a new 360-degree virtual reality film about Antarctica was nearly the same as visiting the icy landmass, but without the smell of penguin poo. For the director of the National Museum of Australia, Mathew Trinca, seeing The Antarctica Experience, was like listening to the song of the earth. 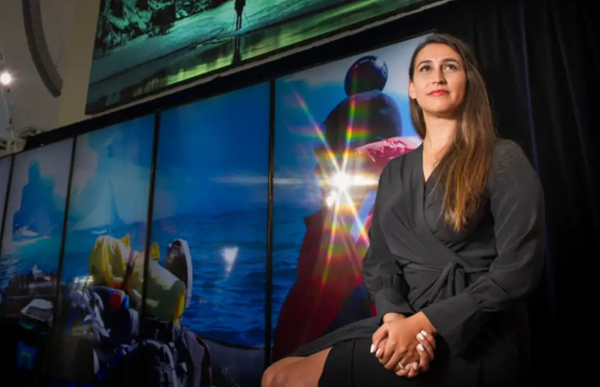 “It is astonishing,” he said of the documentary – the first 3D film of Antarctica – which opened at the museum in Canberra on Thursday after a sold-out season in Perth. Mr Trinca said there had never been a more important time to learn about what is happening on the frozen continent. It shows we live in a very, very special place and the earth is not something we can disregard; it is something we need to listen very carefully. Made by young Western Australian filmmaker Briege Whitehead, the film showcases Antarctica’s sights and sounds from the squawks of a penguin colony to the lights of the Southern Aurora by using drones, new technology and 3D cameras. If a viewer looks around while wearing 3D goggles, they may see Ms Whitehead sitting behind them in a helicopter, a penguin under their feet or feel slightly sick as they fly over a massive wall of ice. The documentary features the work of scientists who work in some of the harshest conditions on the largest and oldest ice sheet on the planet. Its message is gentle but unmistakable. Although Ms Whitehead said she’s baffled that some people still refuse to believe climate change was occurring, she did not “want to hit people over the head” but let them come to their own conclusions by showcasing the science and the icy cap’s fragility. “When people get to experience something themselves, they’re far more likely to be moved by it,” she said. Ms Whitehead profiles the research of three scientists: glaciologist Dr Sarah Thompson at Sorsdal Glacier, sea bird ecologist Dr Louise Emmerson and Dr van Ommen to show how climate change is affecting the icy continent that stores 80 per cent of the world’s waters. Starting at Davis Station, the documentary shows where the 90 staff work and eat as they try to understand how climate changes hitting the southern continent will affect the rest of the planet. Later a helicopter lands, carrying the station’s most “precious cargo” – ice core samples that provide physical evidence of how CO2 levels have risen from 280 parts per million to more than 400 parts per million. Few people get to visit Antarctica. Dr van Ommen, who has visited at least a dozen times over 25 years, said the Australian Antarctic Division agreed to participate because it was a way to convey its research to the taxpayers who fund it. “It informs us about where we are driving the planet in terms of the climate, and it is our collective future,” he said. Dr van Ommen, the program leader for climate processes and change at the Australian Antarctic Division, also captures the excitement that is building as Australian and European scientists prepare to attempt to find what he describes as the “Holy Grail” in ice core science – a continuous core of ice going back one million years. Within two years, scientists expect to start digging 2800 metres deep into the ice in the hope of retrieving a core of ice that will record changes for a million years. Two parallel cores are planned, to provide the best chance of success and to validate findings.